ذوالفقاری پور, محمدامین, احمدی, آزاده. (1393). تدوین سیاست‎‌های تخصیص بار آلودگی در رودخانه‌ها با استفاده از رویکرد گزینش اجتماعی. مجله آب و فاضلاب, 25(6), 36-46. محمدامین ذوالفقاری پور; آزاده احمدی. "تدوین سیاست‎‌های تخصیص بار آلودگی در رودخانه‌ها با استفاده از رویکرد گزینش اجتماعی". مجله آب و فاضلاب, 25, 6, 1393, 36-46. ذوالفقاری پور, محمدامین, احمدی, آزاده. (1393). 'تدوین سیاست‎‌های تخصیص بار آلودگی در رودخانه‌ها با استفاده از رویکرد گزینش اجتماعی', مجله آب و فاضلاب, 25(6), pp. 36-46. ذوالفقاری پور, محمدامین, احمدی, آزاده. تدوین سیاست‎‌های تخصیص بار آلودگی در رودخانه‌ها با استفاده از رویکرد گزینش اجتماعی. مجله آب و فاضلاب, 1393; 25(6): 36-46. در این مقاله، مدیریت کیفی رودخانه به‌منظور حداقل‌سازی هزینه‌های حفظ محیط زیست و تأمین معیارهای کیفیت آب انجام شد. به‌منظور لحاظ‌کردن نقش تخلیه‌کنندگان بار آلودگی در تصمیم‌گیری و افزایش قابلیت اجرا برای برنامه‌های پیشنهادی تخصیص بار آلودگی در رودخانه، از رویکرد گزینش اجتماعی استفاده شد. ابتدا برای هر تخلیه‌کننده، سناریوهای مختلف تصفیه فاضلاب، مشخص و گزینه‌های تصفیه که ترکیبی از سناریوهای تصفیه هستند، تعریف شدند. سپس با استفاده از مدل شبیه‌سازی کیفی Qual2kw، برای هر یک از گزینه‌های تصفیه، مقادیر جریمه تخطی از استاندارد کیفی محاسبه شد و هر یک از تخلیه‌کنندگان، گزینه‌های تصفیه را بر اساس هزینه‌های آن اولویت‌بندی کردند که شامل هزینه‌های تصفیه و جریمه تخطی از استاندارد کیفی بود. 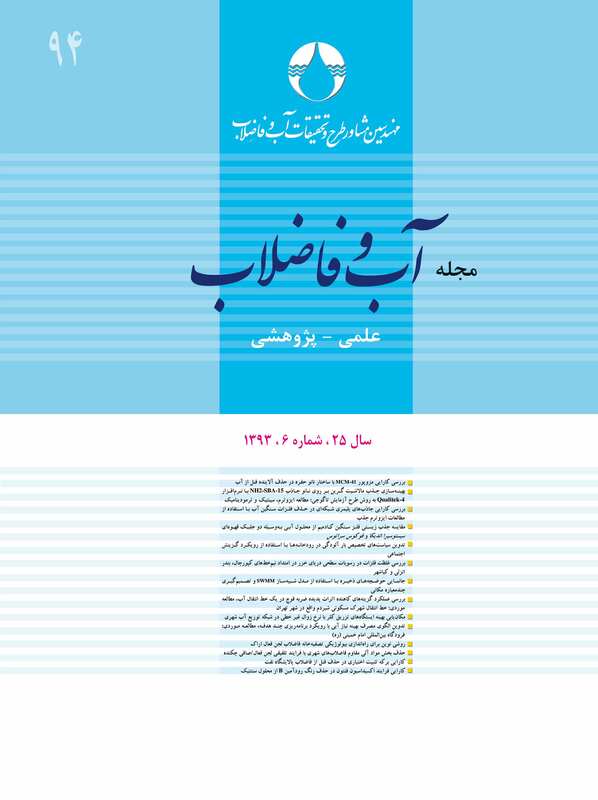 در نهایت با استفاده از روش‌های مختلف گزینش اجتماعی، گزینه‌ مطلوب تصفیه انتخاب شد. همچنین به‌منظور کاهش هزینه‌ها و ایجاد انگیزه برای تخلیه‌کننده‌ها برای مشارکت در حفاظت کیفی رودخانه، گزینه مطلوب تصفیه به‌عنوان مجوز اولیه تخلیه بار آلودگی با استفاده از سیستم نسبت-تجارت توسعه ‌یافته بین تخلیه‌کننده‌ها مورد تبادل قرار گرفت. نتایج حاصل از کاربرد مدل پیشنهادی در یک مطالعه موردی که قسمتی از رودخانه‌ زرجوب در شمال ایران بود، نشان داد که تدوین سیاست‌های تخصیص بار آلودگی رودخانه‌ها کارایی مناسبی دارد. In this paper, river water quality management was implemented to minimize the costs of environmental protection and to meet the environmental water quality requirements. For this purpose, the social choice approach was adopted to consider the role of wastewater dischargers in the decision-making process and to increase the applicability of the proposed waste load allocation programs. Firstly, different wastewater treatment scenarios were identified for each water pollutant and treatment alternatives which are combinations of treatment scenarios were defined. For each treatment alternative, penalties due to violations of river water quality standards were then calculated using the qualitative simulation model (Qual2kw) and each discharger was assumed to prioritize the treatment alternatives based on the treatment costs and the fines defined for water quality standard violations. Finally, using different social choice methods, the most preferred treatment alternative was identified. In order to reduce costs and to encourage dischargers to participate in river water quality protection programs, the most preferred treatment alternative was exchanged among the dischargers as an initial discharge permit using the extended trading-ratio system (ETRS). The results of applying the proposed model to a case study, the Zarjub River located in north Iran, showed the model’s efficiency in developing river waste load allocation strategies. J. of Group Decision and Negotiation, 19(2), 149-168. Shalikarian, L., Madani, K., and Naeeni, S. (2011). “Finding the socially optimal solution for California’s Sacramento-San Joaquin Delta problem.” Proceeding of the 2011 World Environmental and Water Resources Congress, 3190-3197. J. of Water Resources Management, 27(7), 2125-2136. J. of Environmental Economics and Management, 49(1), 83-102. Niksokhan, M.H., Kerachian, R., and Karamouz, M. (2009). “A game theoretic approach for trading discharge permits in rivers.” J. of Water Science and Technology, 60(3), 793-804. Lopez-Villarreal, F., Rico-Ramirez, V., Gonzalez-Alatorre, G., Quintana-Hernandez, P.A., and Diwekar, U.M. (2011). “A mathematical programming approach to pollution trading.” J. of Industrial and Engineering Chemistry Research, 51(17), 5922-5931. Zhang, Y., Wu, Y., Yu, H., Dong, Z., and Zhang, B. (2013). “Trade-offs in designing water pollution trading policy with multiple objectives: A case study in the Tai Lake Basin, China.” J. of Environmental Science and Policy, 33, 295-307. Roberts, K. (2005). Social choice theory and the informational basis approach, Department of Economics, University of Oxford, UK. Arrow, K.J. (1963). Social choice and individual values, Yale University Press, USA. 10. D'Angelo, A., Eskandari, A., and Szidarovszky, F. (1998). “Social choice procedures in water-resource management.” J. of Environmental Management, 52(3), 203-210. 11. Young, P. (1995). “Optimal voting rules.” J. of Economic Perspectives, 9, 51-64. 12. De Borda, J.C. (1781) Memoire sur les elections au scrutiny, Histoire de l’Academie Royale desSciences, Paris. 13. Merlin, V., Sanver, I.O., and Sanver, M.R. (2006). Properties of majoritarian compromise, efficient compromise, and related compromise rules, Springer Pub., Berlin. 14. Bassett Jr, G.W., and Persky, J. (1999). “Robust voting.” J. of Public Choice, 99(3-4), 299-310. 15. Sertel, M.R., and Yilmaz, B. (1999). “The majoritarian compromise is majoritarian optimal and subgame perfect implementable.” J. of Social Choice and Welfare, 16(4), 615-627. 16. Nurmi, H. (1999). Voting paradoxes and how to deal with them, Springer, Berlin. 17. Mesbah, S.M., Kerachian, R., and Nikoo, M.R. (2009). “Developing real time operating rules for trading discharge permits in rivers: Application of Bayesian Networks.” J. of Environmental Modelling and Software, 24(2), 238-246. 18. Pelletier, G.J., Chapra, S.C., and Tao, H. (2006). “QUAL2Kw-a framework for modeling water quality in streams and rivers using a genetic algorithm for calibration.” J. of Environmental Modelling and Software, 21(3), 419-425. 19. Pelletier, G., and Chapra, S. (2005). “QUAL2Kw theory and documentation (version 5.1), A modeling framework for simulating river and stream water quality, retrieved.” (May 2005).